How to find reliable commercial repairers? Interest in community repair keeps growing everywhere. However, volunteer efforts cannot substitute the need for a vibrant repair economy. We constantly receive requests for advice on commercial repairers: for a lot of people, access to a reliable service makes all the difference between repairing and buying a new product. Searching for repair businesses is time-consuming and often frustrating. Aside from the price of repairs, many other factors contribute: the quality of spare parts, customer care, proximity and more. For this pilot, we concentrated on easily verifiable criteria, such as a trading address in the area surveyed; provision of information on warranty repairs; a strong majority of positive online reviews. 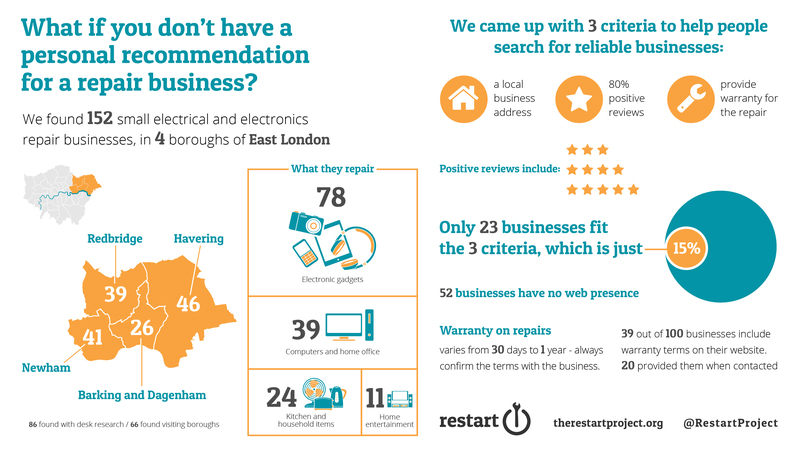 We found that only 23 of the 152 businesses meet all criteria: 85% of them either fail on either online reviews or don’t provide information on their warranty terms (or both). We were surprised to find that 52 businesses – over a third – don’t have any web presence at all, including on social media. In terms of online reviews, we only looked at businesses which received at least 5 reviews on platform such as Google, Yell, TrustPilot and Facebook. We decided that 80% of all 3/4/5 star reviews would be a good indication of a business’ reputation. We acknowledge that this process might not favour businesses without a direct online presence. Similarly, we would have expected businesses to communicate more prominently about their warranty terms. Yet, only 39 mentioned them at all on their website. Here is a short interview with James Diamond, from Hackney Fixers, who worked with us on this project. This is work in progress – and we’re keen to improve it in the future. Please share your views on our criteria and what else we should be looking for. We’re particularly keen to hear from repair businesses: how can you best inspire confidence in prospective customers and promote more repair? How can your services stand out in a crowded market where some players take unprofessional shortcuts? We’ve researched the changing landscape of the commercial repair sector in East London: some smaller businesses are finding it tough to compete with superstores and large manufacturers, and the next generation of younger repairers face an uncertain career path. Hey guys, if you ever do South London repair businesses review, we at TFix would love to be considered. Our aim is to smarten up repair industry by providing professional services, which would be approachable for local consumers. Love your approach at restart. I wish to try and influence Government policy and Corporate Governance in the future but have to start first with a mission to try and transform the landscape for buying and selling parts. My recent blog should resonate with your audience and objectives. (https://blog.buyanypart.co.uk/refocus-redesign-repair-the-ecological-3rs-become-6-e51f0337cc09). I would love to hear if I can help your efforts.